Published on February 24, 2014 in Fun Stuff and Positive Thinking. 1 Comment Tags: Kindness, Pay it forward, Random Act Of Kindness, The Law Of Attraction. I think we have all heard the expression – pay it forward – be nice to someone without any expectation of reciprocation and at some point in the future, someone else will do the same for you. 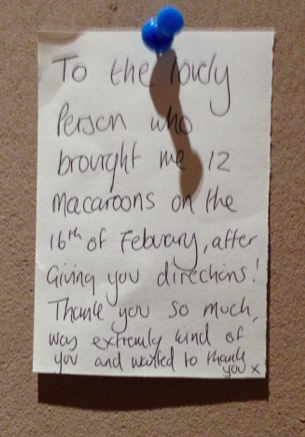 I saw this note on our building’s bulletin board and thought it was sweet for someone to be kind and purchase the macaroons, but then the recipient wanted to publicly (yet anonymously) thank him/her. It made my day to realise that there are still a lot of really, nice, kind, generous people in the world! Have a fabulous day and “pay it forward” in your own way. Published on February 10, 2014 in Motivation, Positive Thinking and Vision and Planning. 0 Comments Tags: Inspiration, peace, relaxation, serenity.